We do not ship products or parts outside of the USA. If you have a question or want to make a purchase, please contact the Nolan agent in your country. For a list of agents please refer to the Nolan Distributor List . For all orders, except orders of small parts and flat items, we use UPS Ground as the standard shipping method. Please note that depending on the value of your order and to avoid problems, we may require your signature at the time of delivery. For all small parts and flat items, we use USPS Mail services. Before you return anything please read the following! If you are not entirely satisfied with your purchase, you may return the unused item in its original packaging within 30 days of the date of the invoice. FOR EXCHANGES: Call us at our toll free number, 866-243-5638 to obtain a Return Authorization Number (RA) and return your purchase in the original packaging with all accessories and manuals, with a copy of your original receipt to exchange for another size. Packages without a Return Autorization Number (RA) will not be accepted. FOR RETURNS: Call us at our toll free number, 866-243-5638 to obtain a Return Authorization Number (RA) and return your purchase in the original packaging with all accessories and manuals, with a copy of your original receipt. Packages without a Return Autorization Number (RA) will not be accepted. A refund of the price of the merchandise and taxes will be given upon receipt of the merchandise, however shipping and handling for the delivery and return will not be refunded. A 15% restocking fee will be applied to all returns if the customer does not want to exchange the product, and just wants to return it. Refunds will be issued in the same method of payment as the original transaction payment. We may refuse an exchange or return if your merchandise is found to be used, dirty, stained, or damaged. We are the sole judge of what constitutes"dirty, stained or damaged", as well as "used" or "worn". Sorry, we cannot accept returns on used helmets and/or accessories. Any product that has been worn will not be accepted. The product will be returned and no refund will be issued. Sorry, we cannot accept returns on used N-Com systems and/or accessories. 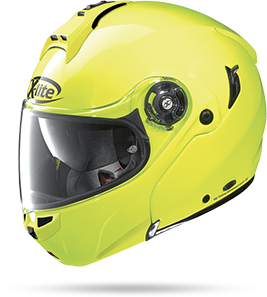 Any N-Com product that has been installed in a helmet will not be accepted. The product will be returned to you and no refund will be issued. Please check your packages as soon as you receive them. If the package is damaged, do not accept it or write “damaged” on the receipt before you do. If the order is not correct, or the sizing is wrong, please contact us immediately for an exchange. Our toll-free number is 866-243-5638. We have to hear from you before you ship anything back or we will not accept your package when it arrives. When you call to describe your problem, we will give you a Return Authorization Number (RA) that you need to write on the package. Make sure that you do this, or we will not accept your package. You have 30 days to return any item, using any shipping method of your choice, the cost of the return shipping is your responsibility except if we made a mistake on the original order. We will not be held responsible for returned products that are lost in transit. We suggest using reputable carriers that offer a method of tracking such as: UPS, Fedex and some US Postal methods allowing for tracking and signature. All claims for lost or damaged goods will be filed by the shipper with the carrier. All returned products have to be in perfect unworn, unused condition, with all the intact packing material, manuals and accessories. We carefully inspect all items that come back to us. Any items that we judge can’t be sold after you return it will be returned to you and no credit will be issued. As a general rule, please don’t try to return used items or items that you would not want to receive as a new item! There will be a 15% re-stocking fee to any product being returned that has been determined to have been damaged due to customer neglect or doesn't meet our return criteria. Toll free in the USA - 866-243-5638.